Mark Zuckerberg loves his dog, Beast, a kind of Hungarian Sheepdog. 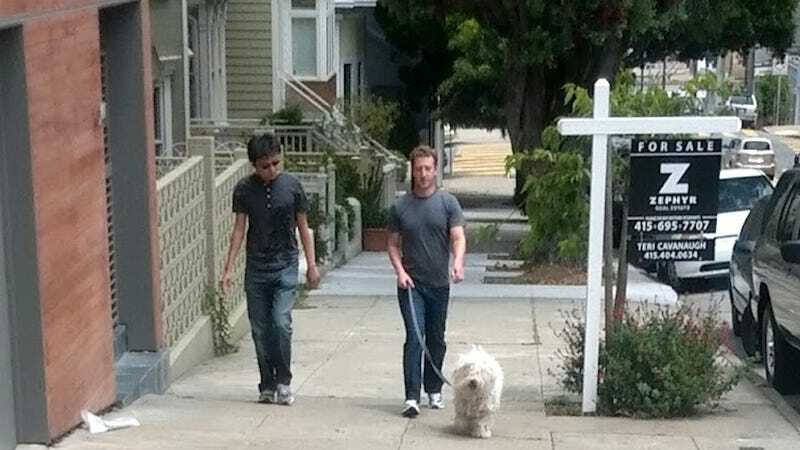 Sometimes Beast is carried around like a furry emperor, or sometimes Zuck just takes him for a nice stroll. But who is this mysterious man with them? I was walking down 29th st from Twin Peaks. Passing him, I reached down and petted that dog and said "hiiiiii" in my dog voice. Coming back up we made eye contact and he was remarkably normal. Like. "Some dude just petted my dog without asking but I guess that's okay" face. He smelled like a normal man (im assuming, i have no idea) but his nikes were impeccably clean. Remember, put on your sunscreen, unzip that hoodie, and email your Summer of Zuck personal paparazzi photos to zuck@gizmodo.com. Update: Readers have chimed in to point out that Beast's specific breed is a Puli, and that "Guessing by the softness of his shadow, I would say it's overcast." Thanks guys!